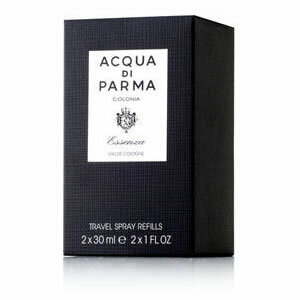 Colonia Essenza Travel Spray Refills are two 30ml bottles of Acqua di Parma Colonia to fit perfectly within the Acqua di Parma leather pouch. Acqua Di Parma Colonia Essenza is an innovative and creative re-imagining of Colonia; a 'Grand Cru' fragrance that only uses the finest ingredients to enhance its muse. In the language of perfumery, Colonia Essenza is the final distillate; a composition of the purest and finest natural ingredients.